When I leave on a long bike ride (over 2 hours) I like to make sure I pack along an energy bar to eat mid way through the ride. 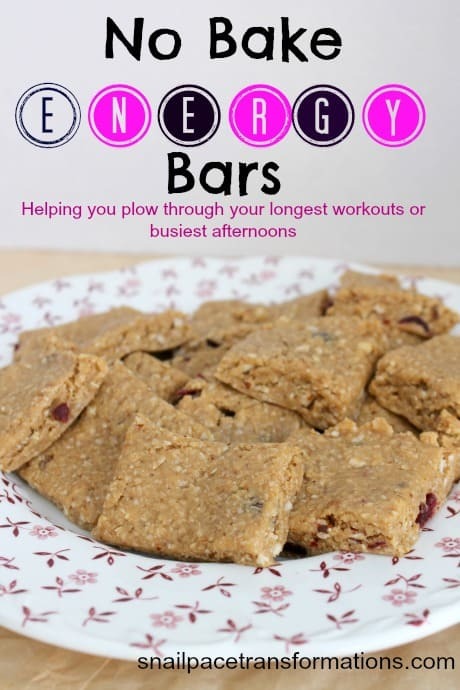 Energy bars are also great to slip into your purse if you know you are going to be out all afternoon and you don’t want to arrive home famished only to blow your diet by chowing down on whatever is in site while you make dinner for the family. As great as energy bars are though, they can be expensive to buy ready made and they can also have a lot of added ingredients that are not that great for you. Making your own is not as difficult as you might think. This recipe takes me mere minutes to make. First you combine natural peanut butter, raw honey and, oil in a sauce pan. I use olive oil, but I am guessing you could substitute various oils and it would still turn out fine. Place the sauce pan on the stove over warm heat and keep stirring until all the ingredients blend together well. While the wet ingredients are melting together, I mix together the dry ingredients. 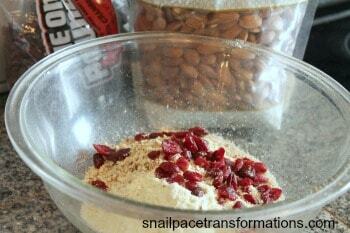 I like placing my almonds and oats in my food processors for a few moments to crush them down a bit. It really isn’t necessary though, you can leave your quick oats whole if you like, and you could either buy the almonds already slivered, or place them whole in a ziploc bag and hit them a few times with your rolling pin (great way to release built up aggression 🙂 ). Once I mix together the wet and dry ingredients I place the mixture in a lightly greased 8 by 8 pan and then place them in the freezer for about 30 minutes to firm the up. Once the bars are firm pan I like to slice into 8 to 16 bars and place them in small ziploc bags then lay them flat in our freezer. If you cut the pan into 8 bars each bar has 300 calories if you cut it into 16 each bar has 150 calories. By placing these bars in ziploc bags they are super handy for me to grab as I am leaving for a long bike ride or a long afternoon of errands and activities. They do not take long to thaw. In case you were wondering where I store the bars while out riding my bike, I put them in a small handlebar bag. 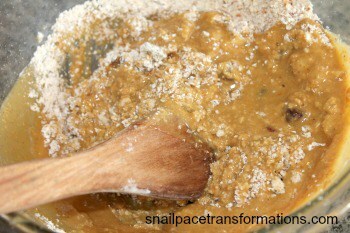 Follow Victoria @Snail Pace Transformations’s board No Bake Treats on Pinterest. 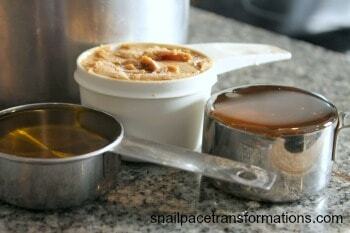 Mix together peanut butter, honey and oil in a saucepan and place on stove top at medium heat. Remove when mixture becomes well blended and runny in texture. In a separate bowl combine all the dry ingredients and blend together. Mix your peanut butter, honey and oil combo. into your dry ingredients. Place it all in a 8X8 pan that has been lined with wax paper and lightly oiled. Press the mixture down in the pan till you have uniform thickness. Cut into 8 to 16 bar size pieces. No bake cookies! Perfect for super busy days when you just need a grab-and-go snack! I agree! Do you make the ones with peanut butter, or the plain oatmeal ones, or the ones like I listed a few weeks ago on my blog that have coconut and raisins in them, those are my husbands favorites. I like the peanut butter ones best. plains and p&b! not a fan of coco and raisins. i read that somewhere. Or was it here too? lol. forgot already! I’ve made some like this before only without the oats… chia seems to work well with nut butters to give a long lasting yumminess to homemade bars…have you tried it?? No I haven’t. Where do you purchase chia? Hi, I have a question: I am planning on taking this for my bike training, that´ll be probably 2+ hours, and I´m wondering if these will melt? Well I usually store mine in the freezer and take them out just as I am leaving, and then eat them about half way during my 2 hour bike rides and they are soft, but not melted. I usually don’t go out in temperatures above 75 though so I guess it would depend on how hot it is. Plus I store mine in a small handle bar pack and not on my body in a pocket, so that makes a big difference as well. Hope that helps. Thanks for sharing your recipe – I can’t wait to try it.